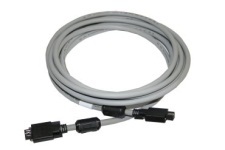 This cable has a 9-pin screw-lock connector on each end. It supports speeds up to S800. Firewire 9-pin Plug (Male) IEEE-1394b S800 Qty 2 Screw lock connectors. Ferrites included.